The Royal Livingstone hotel in Zambia, overlooking the Victoria falls, is where 5-star luxury meets nature’s majesty. 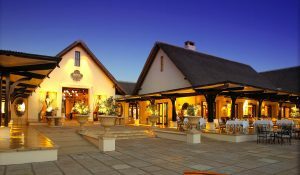 Easily accessible from Johannesburg, South Africa, The Royal Livingstone feels like it is a million miles from ordinary. Offering guests a once in a lifetime experience right on the banks of the Zambezi River overlooking the thundering Victoria Falls,the hotel is the perfect setting for a dream vacation or destination wedding. Renowned for its colonial-inspired décor, The Royal Livingstone owes its existence to its named in honour of the explorer David Livingstone. On 16th of November 1855, David Livingstone discovered the mighty Victoria falls that would define his life story, and that of an entire country. Visible from over 30 kilometres away, the Kololo people with whom he had travelled downriver called it Mosi-oa-Tunya – the smoke that thunders. As the first European to witness this magnificent site, he decided to name it Victoria Falls in honour of the queen of England. The Royal Livingstone hotel’s Luxury King Rooms reflect the textures and moods of the majestic Zambezi river. The Luxury King Room sleeps 2 and includes a king-size bed. The spacious private veranda completes the deluxe appeal of the room. To make the most of the outdoor, all rooms are fitted with insect repellant devices and sprays. The Victorian style en-suite bathroom is stocked with Molton Brown products and includes an electric shaver plug (110 volts AC, 50 cycles). The Luxury King Room also includes a separate guest toilet. All of the rooms have WiFi access, air conditioning and heating with individual controls and a flatscreen TV. Interleading rooms available on request and there is 24-hour room service. The Royal Livingstone hotel is perfectly situated on the banks of the Zambezi River and reflects the vibrant energy of the natural space. The Luxury Twin Room sleeps 2 and includes 2 twin beds and is luxuriously furnished with a private veranda. To make the most of the outdoor, all rooms are fitted with insect repellant devices and sprays. The Victorian style en-suite bathroom is stocked with Molton Brown products and includes an electric shaver plug (110 volts AC, 50 cycles). All of the rooms have WiFi access, air conditioning and heating with individual controls and a flatscreen TV. Interleading rooms are available on request and there is 24-hour room service. The Royal Livingstone Hotel’s Accessible Rooms are specially designed to ensure maximum comfort. There are 2 Paraplegic Rooms – 1 with a king-size bed and another with 2 single beds. The Accessible Room sleeps 2 people and includes a private veranda. To ensure outdoor relaxation, all rooms are fitted with insect repellant devices and sprays. The Victorian style en-suite bathroom is stocked with Molton Brown products and includes an electric shaver plug (110 volts AC, 50 cycles) and a shower stool with rails for easy accessibility. All of the rooms have Wi-Fi access, air conditioning and heating with individual controls and a flat-screen TV. Interleading rooms available on request and there is 24-hour room service. The Royal Livingstone Hotel’s Luxury Corner King Rooms echo the majesty of mighty Zambezi River. The Corner King Hotel Rooms sleeps 2 and includes a king-size bed and private enclosed patio. This tranquil space is protected from the elements with a sliding door, appropriately fitted with refined mosquito netting, which allows for an extra sleeping and lounge area. There is a wicker sofa where you can laze comfortably enjoying the gentle breeze of the ceiling fan. The Victorian style en-suite bathroom is stocked with Molton Brown products and includes an electric shaver plug (110 volts AC, 50 cycles). The Corner King Hotel Room also includes a separate guest toilet. All of the rooms have WiFi access, air conditioning and heating with individual controls and a flat screen TV. The Corner King Hotel Room also include a shoe cabinet and luggage rack. Interleading rooms available on request and there is 24-hour room service. The Royal Livingstone’s Corner Luxury Twin Rooms are ideal for outdoor enthusiasts. The Corner Luxury Twin Room sleeps 2 and includes 2 twin beds and a private enclosed patio. This tranquil space is protected from the elements with a sliding door, appropriately fitted with refined mosquito netting, which allows for an extra sleeping and lounge area. There is a wicker sofa where you can laze comfortably enjoying the gentle breeze of the ceiling fan. The Victorian style en-suite bathroom is stocked with Molton Brown products and includes an electric shaver plug (110 volts AC, 50 cycles). All of the rooms have WiFi access, air conditioning and heating with individual controls and a flatscreen TV. The Corner Luxury Twin Room also includes a shoe cabinet and luggage rack. Interleading rooms available on request and there is 24-hour room service. 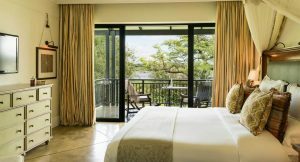 The Royal Livingstone’s Luxury Suites incorporate the natural textures of the surrounding Zambezi environment and are popular for their classic and luxurious décor. The Luxury Hotel Suite sleeps 2 and includes a king-size bed, dressing area, separate lounge, wet bar and private veranda. To make the most of the outdoor, all rooms are fitted with insect repellant devices and sprays. The Victorian style en-suite bathroom is stocked with Molton Brown products and includes an electric shaver plug (110 volts AC, 50 cycles). All of the rooms have WiFi access, air conditioning and heating with individual controls and a flatscreen TV Interleading rooms available on request and there is 24-hour room service. The Royal Livingstone Hotel’s Presidential Suites are a testament to the immaculate class and style that is so prevalent throughout the hotel. The spacious Presidential Suite sleeps 2 and includes a king-size bed, dressing area, separate lounge, dining area and private veranda. To make the most of the outdoor, all rooms are fitted with insect repellant devices and sprays. The Victorian style en-suite bathroom includes a Victorian tub, twin vanities and a walk-in shower. The Presidential Suite en-suite bathroom is also stocked with Molton Brown products and includes an electric shaver plug (110 volts AC, 50 cycles). The Presidential Suite also includes a separate guest toilet. All of the rooms have WiFi access, air conditioning and heating with individual controls and a flatscreen TV. 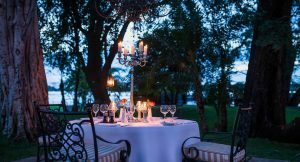 The Royal Livingstone’s restaurants and bars overlook the mighty Zambezi River and majestic Victoria Falls. The Sundecks overlooking the Zambezi River at The Royal Livingstone Hotel make the perfect setting in which to honour this fine tradition, as the sun slips gently into the mist of the thundering falls. The Royal Livingstone Dining Room will feed your soul and your stomach. Indulge in our fine African-inspired cuisine, and soak up the historical atmosphere of the glorious setting. Indoor tables offer a more intimate dining experience while those outside bring to life the sights and sounds of an African day. The Lounge and Travelers’ Bar caters for high teas and drinks against a backdrop of grand paintings of David Livingstone and décor harking back to an age of exploration and adventure. The main attraction to Zambia, the Victoria Falls, is only a 15 minute walk from the hotel and as a Royal Livingstone hotel guest, you have unlimited free access to the Falls via the resort`s own private entrance. Guests can also enjoy three walking trails throughout the entire Falls Resort. Feel time slip away with a therapeutic massage at The Royal Spa overlooking the Zambezi River. You can relax in exquisite tents shaded by ancient trees or enjoy a treatment from the comfort of your hotel room. You may even see our resident zebras grazing by the pool. If your idea of a holiday includes doing absolutely nothing at all, then any one of the hammocks dotted alongside the river are sure to catch your fancy, or you could laze by the pool right on the banks of the Zambezi River with breathtaking views and a cocktail.